Before you upload a Windows virtual machines (VM) from on-premises to Microsoft Azure, you must prepare the virtual hard disk (VHD or VHDX). Azure supports only generation 1 VMs that are in the VHD file format and have a fixed sized disk. The maximum size allowed for the VHD is 1,023 GB. You can convert a generation 1 VM from the VHDX file system to VHD and from a dynamically expanding disk to fixed-sized. But you can't change a VM's generation. For more information, see Should I create a generation 1 or 2 VM in Hyper-V.
For more information about the support policy for Azure VM, see Microsoft server software support for Microsoft Azure VMs. The instructions in this article apply to the 64-bit version of Windows Server 2008 R2 and later Windows server operating system. For information about running 32-bit version of operating system in Azure, see Support for 32-bit operating systems in Azure virtual machines. If you need to convert your virtual disk to the required format for Azure, use one of the methods in this section. Back up the VM before you run the virtual disk conversion process and make sure that the Windows VHD works correctly on the local server. Resolve any errors within the VM itself before you try to convert or upload it to Azure. After you convert the disk, create a VM that uses the converted disk. Start and sign in to the VM to finish preparing the VM for upload. The commands in this article must be run on an elevated PowerShell session. You can convert a virtual disk by using the Convert-VHD command in Windows PowerShell. Select Run as administrator when you start PowerShell. In this command, replace the value for "-Path" with the path to the virtual hard disk that you want to convert and the value for "-DestinationPath" with the new path and name of the converted disk. If you have a Windows VM image in the VMDK file format, convert it to a VHD by using the Microsoft VM Converter. For more information, see the blog article How to Convert a VMware VMDK to Hyper-V VHD. To view the route table, run route print at the command prompt. Check the Persistence Routes sections. If there is a persistent route, use the route delete command to remove it. You may receive an error message when you run the Set-ItemProperty -Path 'HKLM:\SOFTWARE\Policies\Microsoft\Windows NT\Terminal Services -name <object name> -value <value> in these steps. The error message can be safely ignored. It means only that the domain is not pushing that configuration through a Group Policy object. When you deploy a VM, the default rules are created against port 3389. If you want to change the port number, do that after the VM is deployed in Azure. This is to make sure that you can connect at the beginning when you deploy the VM. You can also review this on a later stage after the VM is deployed in Azure if needed. Make sure that the report shows a clean and healthy disk. Set the Boot Configuration Data (BCD) settings. Make sure you run these commands on an elevated PowerShell window. Set-ItemProperty -Path 'HKLM:\SYSTEM\CurrentControlSet\Control\CrashControl' -name DumpFile -Type ExpandString -force -Value "%SystemRoot%\MEMORY.DMP"
New-ItemProperty -Path $key -name DumpFolder -Type ExpandString -force -Value "c:\CrashDumps"
If the repository is corrupted, see WMI: Repository Corruption, or Not. Follow these extra steps to prepare the disk. Make sure that you know the DSRM password in case you have to start the VM in DSRM at some point. You may want to refer to this link to set the DSRM password. Restart the VM to make sure that Windows is still healthy can be reached by using the RDP connection. At this point, you may want to create a VM in your local Hyper-V to make sure the VM is starting completely and then test whether it is RDP reachable. Remove any extra Transport Driver Interface filters, such as software that analyzes TCP packets or extra firewalls. You can also review this on a later stage after the VM is deployed in Azure if needed. Uninstall any other third-party software and driver that is related to physical components or any other virtualization technology. Sysprep is a process that you could run into a windows installation that will reset the installation of the system and will provide an “out of the box experience” by removing all personal data and resetting several components. You typically do this if you want to create a template from which you can deploy several other VMs that have a specific configuration. This is called a generalized image. If, instead, you want only to create one VM from one disk, you don’t have to use sysprep. In this situation, you can just create the VM from what is known as a specialized image. If you want to create a generalized image, you need to run sysprep. For more information about Sysprep, see How to Use Sysprep: An Introduction. Not every role or application that’s installed on a Windows-based computer supports this generalization. So before you run this procedure, refer to the following article to make sure that the role of that computer is supported by sysprep. For more information, Sysprep Support for Server Roles. After you run sysprep.exe as specified in the following steps, turn off the VM, and do not turn it back on until you create an image from it in Azure. Sign in to the Windows VM. Change the directory to: %windir%\system32\sysprep, and then run sysprep.exe. 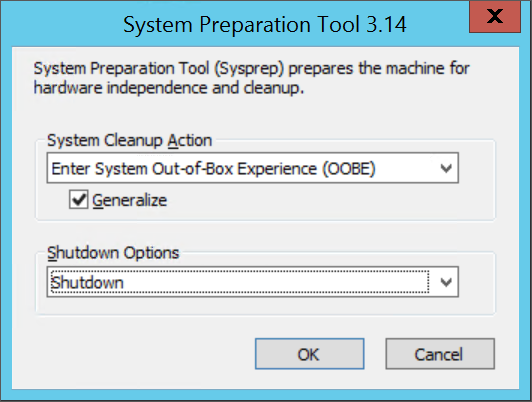 In the System Preparation Tool dialog box, select Enter System Out-of-Box Experience (OOBE), and make sure that the Generalize check box is selected. In Shutdown Options, select Shutdown. When Sysprep completes, shut down the VM. Do not use Restart to shut down the VM. Now the VHD is ready to be uploaded. For more information about how to create a VM from a generalized disk, see Upload a generalized VHD and use it to create a new VMs in Azure. A custom unattend.xml is not supported. While we do support the additionalUnattendContent property, that only provides limited support for adding microsoft-windows-shell-setup options into the unattend.xml that the Azure provisioning agent uses. E.g. they can use additionalUnattendContent to add FirstLogonCommands and LogonCommands. See also additionalUnattendContent FirstLogonCommands example. The following settings do not affect VHD uploading. However, we strongly recommend that you configured them. Install the Azure VMs Agent. Then you can enable VM extensions. The VM extensions implement most of the critical functionality that you might want to use with your VMs such as resetting passwords, configuring RDP, and so on. For more information, see Azure Virtual Machine Agent overview. If there’s any data disk that is attached to the VM, the Temporal drive volume's drive letter is typically "D." This designation could be different, depending on the number of available drives and the settings that you make.